In addition to providing the perfect marquee for your wedding, special occasion or corporate event, Carron Marquees can provide flooring options for a more complete look and feel. Our floors make the ideal space for socialising and dancing, tying together your chosen theme and providing a robust surface that can take everything your guests can throw at it. No matter how long your guests want to dance for, or how energetically they do it, our dance floors will stay in place and maintain their flawless looks. All of Carron Marquees’ dance floors feature a durable, interlocking design. This means they won’t separate or shift, and your guests can don’t need to worry about an uneven surface or gaps appearing on the dance floor. We ensure a perfectly flat surface, with no lumps or bumps underfoot. We assemble our dance floors without the use of screws or tools, which means a quick, easy installation and removal process – all done by our experience, professional and friendly crew. Sleek, elegant and classic, our wooden dance floors provide the perfect accompaniment to traditional weddings and other events, whether your colour scheme is a classic white wedding or if your design errs more towards a modern, eclectic look. Our wooden dance floors cover a large area and provide all the space your guests need to cut loose and enjoy themselves at your event. Robust and hard-wearing, you don’t have to worry about your wooden dance floor shifting, moving or slipping, as we ensure that everything is locked in place and secure before your party arrives. Carron Marquees’ wooden dance floors are the ideal solution for any marquee reception, and they have the looks and performance to add a little something extra to your big event. 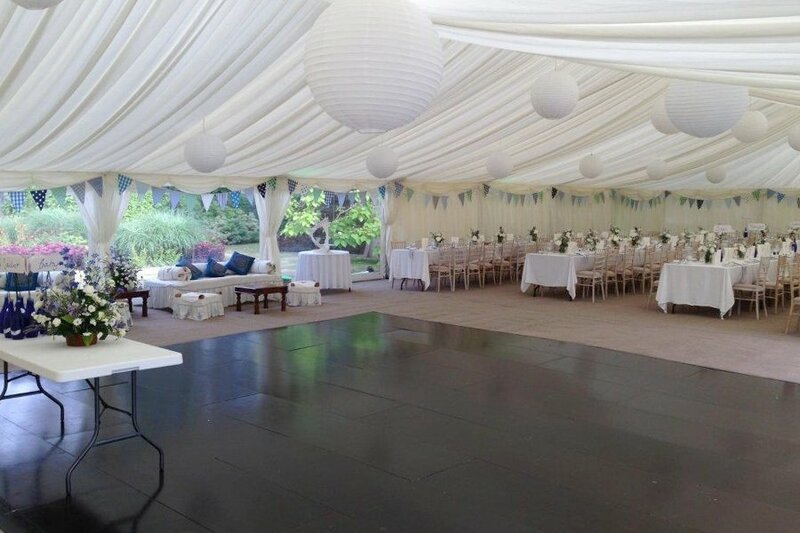 Offering retro, chic looks, our black and white dance floor is the ideal choice for any marquee reception that requires a dash of vintage style. Our black and white dance floor is the perfect solution to any marquee event that features a light-heavy theme. The high gloss finish of the black and white dance floor reflects overhead lights beautifully and creates a fun, lively atmosphere for your guests. Our black and white dance floor comes with a non-slip aluminium edging that ensures your dance floor won’t move or separate over the course of the event. 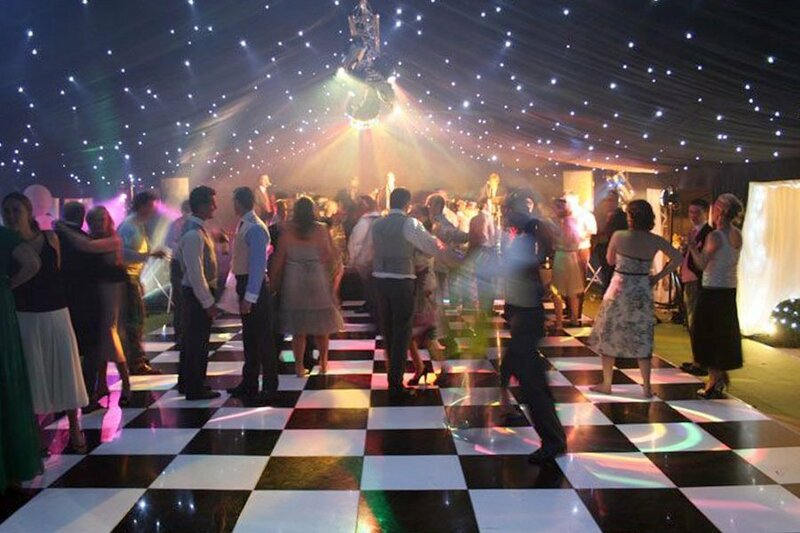 If you want an on-trend, retro look for your marquee event, our black and white dance floor is for you. Many thanks for providing a superb marquee for our wedding reception. The marquee was wonderful and the dance area looked terrific. Our guests were really impressed with the quality of your marquee. We know where to come if we need a marquee again. Thank you so much for the fabulous marquee. We were delighted with everything; the interior looked spectacular and the starlit ceiling over the dance floor provided the perfect space to dance the night away.